I want to take a moment to remind everyone of the reason we have Memorial Day. In the United States it began with the Civil War (or War Between The States) as a time of remembrance of the honored dead. After World War I the day was rededicated to honor those who died in any war. The poem “In Flanders Field” became associated with the memorial observation around 1918. A woman named Moina Michael came across the poem and was deeply moved by its story. 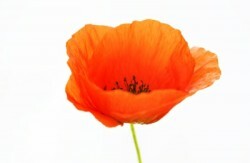 By 1920 she presented to the American Legion and adopted the poppy and the poem as a national emblem of remembrance.